"In September, the Charlottesville City Council agreed to give $178,000 to the Piedmont Housing Alliance to restore two houses and demolish and replace two others in the neighborhood. The Piedmont Housing Alliance plans to raise about $250,000 to cover construction costs" (Kimberly O'Brien, The Daily Progress, December 20, 1997). "The Starr Hill neighborhood's revitalization (began) with a bang Friday morning as bull dozers tore into the side of a house on Sixth Street, ripping down a dilapidated, sagging structure to make way for a new, sound one. 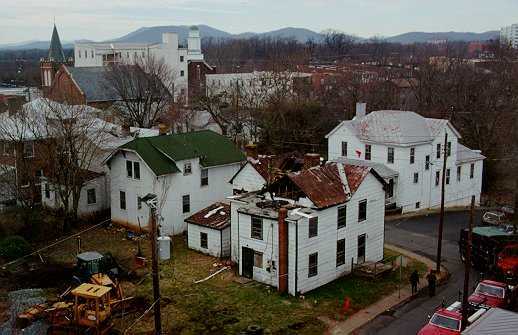 The demolition of the house at 212 Sixth Street and another at 205 Fifth Street Northwest in the historic Charlottesville neighborhood near West Main Street also marks the first phase of a project aimed at increasing middle-class homeownership in the city" (Kimberly O'Brien, The Daily Progress, December 20, 1997). "'It's been our desire that Starr Hill be occupied by people who respect it and its history, said Starr Hill resident Alicia Lugo, who bought her home on Brown Street about two years ago. 'This is the result of a collective dream'" (Kimberly O'Brien, The Daily Progress, December 20, 1997). Joe Hughes, who photographed the picture above, participated in a fire department training exercise at 205 Fifth Street Northwest.